Unlike in the movie it was not the exhibits in the museums that came alive but in was the street itself, the streets surrounding the 6 participating museums were packed with people from all walks of life all wanting to be part of this awesome experience infecting the city. For know I think I’ll carry on dreaming :-D.
The next stop on my list was the Jewish Museum but before we got there we took a detour into the Iziko South African National Gallery, here for me this was abit of a culture shock I admit I am no art fundi, I do appreciate art though but to be honest the Time and Again: A retrospective exhibition by Penny Siopis was abit creepy or even weird. 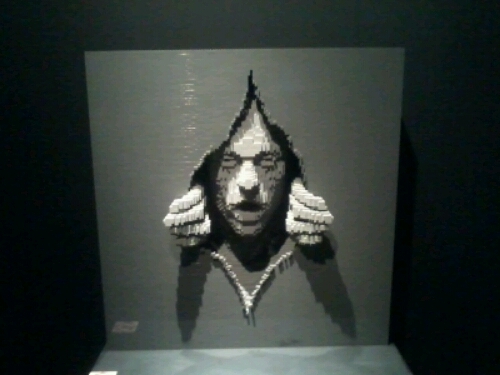 Don’t get me wrong the exhibition is amazing especially the glue and ink collaboration but the subjects are too much, some of it gory to say the least…I guess this is what it is like visiting a museum at night hahaha. My first time at The South African Jewish Museum and it was too short I used this opportunity as an introduction I guess because there is so much history in this museum you cannot take ecperience it properly in one night. The museum is visually stimulating, on the bottom floor you are literally immersed in history walking through a Jewish Shtetl, the model of Jerusalem is also cool. 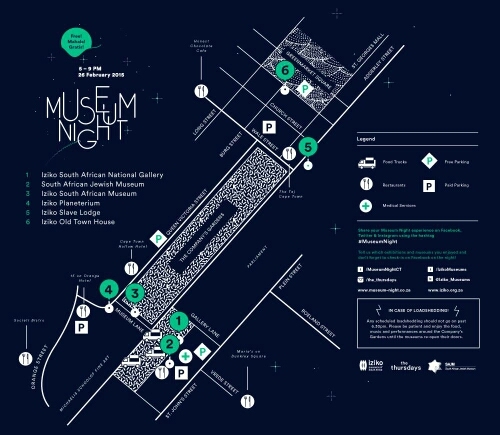 Each museum has its own unique story tonight was a great introduction for individuals to experience something different in a safe environment meeting people and just enjoying what Cape Town has to offer, all for free. 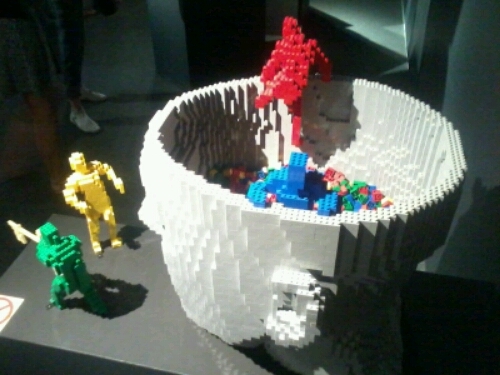 The organisers did an amazing job and I hope this is not the last as I still have 3 museums I need to go to :-D.
This entry was posted in Uncategorized on February 26, 2015 by shaunjengel. I just watched “Shake the Dust” a feature documentary as part of the Design Indaba film festival in Cape Town – The movie spans across three different countries but with one message – It doesn’t matter where you come from through hip-hop you can change the world. Directed by Adam Sjoberg and produced by Hip-Hop legend NAS we are taken into the slums/ghetto of Uganda, Yemen and Colombia where we witness how the love of dancing affects these youngsters lives and how they are using it to attend to the negative social issues in their respective counties. It is a well directed movie, thought provoking and gives one perspective into other areas of life you would not normally see, in the news they are always showing people running around Africa guns blazing, bomb blasts here and there but underlying this destruction there are kids using Hip-Hop to change the world. They are using the Hip-Hop culture to uplift other youngsters promoting education and self reliance – living in the ghetto teaches you to be strong and self dependant from a young age. I enjoyed the dance moves especially the fact that there were B-girls also interviewed, woman can compete with the best of them given the opportunity. Do not let your surroundings affect your life, you can be anything you want to be – Believe in yourself and love what you do.. This entry was posted in Uncategorized on February 25, 2015 by shaunjengel. 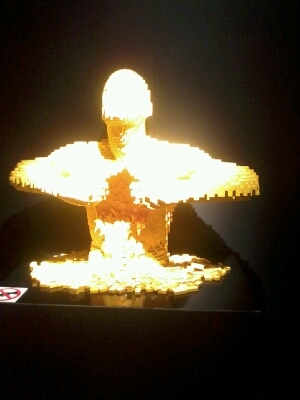 Nathan Sawaya is definitely living that dream by doing what he loves and that is playing and building…. ..these awe-inspiring designs. 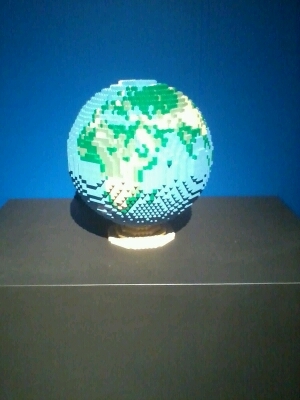 This is all made out of LEGO®, yes thats right those blocks you played with as a kid thousands of tiny blocks put together to create a masterpiece. He creates these designs finding inspiration out of everyday situations and life in general, the exhibition is not only for visual enjoyment but also inspiring. His story is one of following your dreams however crazy it is, he saw that some of these pieces were put onto canvas, marble or even paper..
Art nurtues the brain. Whether made from clay, wood, paint or a modern-day toy. 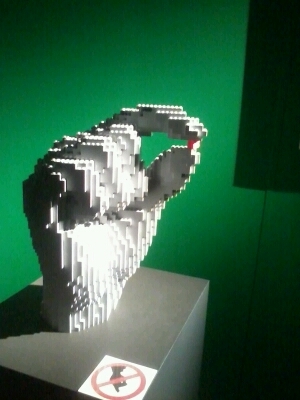 There is nothing better to describe this exhibition but with the words of Batman in the LEGO® Movie…’By GOSH’ it is amazing, from famous paintings like the Mona Lisa and Whistlers Mother to the statue of David all put together with perfect precision.. Create what you have never seen. Your mind can be your best friend or it can be your worst enemy – it is your choice, Nathan Sawaya chose to follow his dream and let the men inside his head loose and inspire young and old alike to visualise something different, something AWESOME. This entry was posted in Uncategorized on February 22, 2015 by shaunjengel. I recently watched the Noah movie an epic adaptation of the book of Noah in Genesis – This movie stirred something inside making me think of the faith that Noah had in the creator Our Father. Any movie based on the Bible reference is going to bring about controversy as it is the directors interpretation of what is read, I went back and read the book of Genesis, some of the things in the movie are not true and correct but then again it is based on the book and the imagination of the director. I think it was a good movie as it captures the modern audience. The story of Noah every young child knows as the man who built the ark with the animals walking two by two but this movie went deeper into the emotion of a man of faith tested to the limit, broken and restored by the Creator Our Father. We all have our own set of problems no man can solve – pray is our only answer the answers do not come immediatly but in time signs are shown. We are born of this earth to leave a legacy, an everlasting story that will be told by many through our actions good or bad. Genesis 7 vs 17 – For forty days the flood kept coming on the earth, and as the waters increased they lifted the ark high above the earth. During this time of lent we are meant to fast, give up something you love as a sacrifice – this allows us to come closer to our Creator but not only this but also through prayer. Genesis 8 vs 21-22 The Lord smelt the pleasing aroma and said in his heart: “Never again will I curse the ground because of man, even though every inclination of his heart is evil childhood. And never again will I destoy all living creatures, as I have done. Reading the story again I feel a sense of hope that every cloud has a silver lining – we all are meant to find the rainbow which is a sign that we are Gods children and he loves each and every one of us – We are meant to share this love with the world. This entry was posted in Uncategorized on February 18, 2015 by shaunjengel. 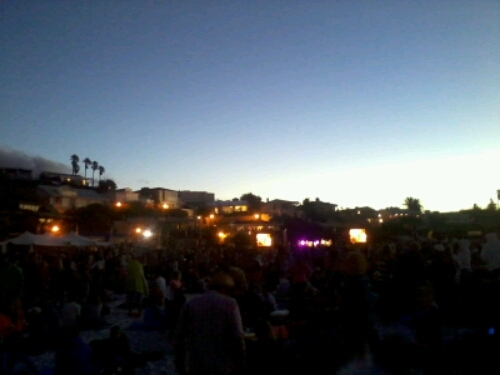 Whether you lovestruck or just looking for a spot to hang out with family and friends the Moonstruck concert at Clifton 4th beach was the place to be. 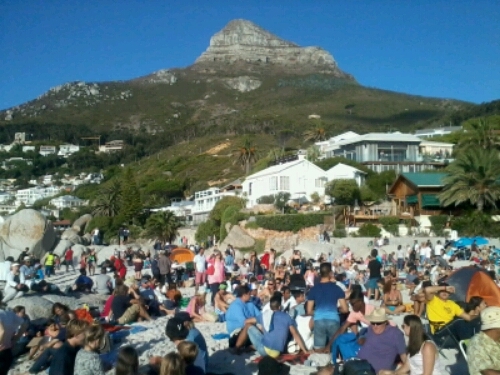 Situated at one of the worlds most beautiful beaches people came in there numbers to enjoy the fine weather and music provided by Freshlyground and it was all free hosted by Cape Talk and Discovery in support of the NSRI. The setting was perfect for a picnic and relaxed afternoon, ok the water is not the warmest but that didn’t stop people from taking a dip in the ocean a refreshing swim is always good for you right :-D.
Freshlyground entertained us with some of their most popular songs, even got the 2010 spirit going when they delivered the World Cup theme song WAKA WAKA – I think I saw Shakira too…ok just kidding Cape Town has hotter woman ;-). Once the sunset the glowsticks came out and some candles which lit the area bringing about a carnivalistic atmosphere with people laughing and dancing basically having a great time with friends family. This is definitely something different and fun for the whole family just remember to come early as it gets pretty packed. Thank You Cape Town and respect to the NSRI for the work that they perform in keeping the ocean safe for all. This entry was posted in Uncategorized on February 14, 2015 by shaunjengel. We are gathered here today to address the public in the State of our Nation – A nation of rich history, A nation of pride, A nation of stuggle hero’s turning in their graves at the site of the events that unfolded today…. Opposition parties escorted out of parlaiment, screams of give back our money, bring back the signal – complaints of no bottled water when there are thousands of people without proper running water, jokes of no service delivery in Parlaiment when the real crisis is right under their noses. All this before our President could deliver his speech to a nation, this is suppose to be a speech of hope but what hope is there when Parlaiment laughs at our sporting hero’s, fails to deliver basic services on ground level. The class of 2014 national Matric pass rate dropped and still textbooks are not being delivered on-time – new universities are being opened but what is the point if the quality of passes are not up to standard. To me the governments focus is more on qauntity than on qaulity. Yes we were happy that the petrol price dropped but food prices stayed the same, My Citi busses are on an ongoing strike and Metrorail still apologising for delays – to ensure growth in the economy transport is a major factor in my opinion ok I am speaking from the Western.Cape but I am sure the problems experienced are Nationwide. Gangsterism, drug abuse and violence against women and children are rife, yes there are increases in people being arrested but how many crimes go unreported because there is no faith in our policing system. Federation, Chad Le Clos. We are a sport loving nation and through sport it brings people together therefore we encourage and support the Protea’s and The Bokke as they look to be World Champions this year. This entry was posted in Uncategorized on February 12, 2015 by shaunjengel. 11 February 1966 is a day that will always be remembered by the District Six community – a date that marked the start of the end. This was the day that District Six was declared a whites-only area. Subsequently, more than 60 000 people were forcibly removed and the buildings were flattened. Tonight I attended the interfaith service of remembrance of this historic day in South African history, to be honest I am not really that clued up on the history of Distict Six therefore I appreciate events like this taking in the learning experience. We had a full programme, a welcoming and explanation of why we were in the Lydia Williams Centre of Memory a living monument of District Six – the meditation was a powerful tool allowing us to look inside ourselves clear our thoughts in order to reflect on the importance of this day with a clear mind. The Reflective talk by Judge Albie Sachs was interesting as he walked us through his memories of exile and coming back to the barren land which he once called home. His memory of the curry in Hanover Street was funny – food really can bring people together. His encouragement to use our rights was inspiring as they did not have the same rights we have today, the freedom these people fought for we should appreciate and be thankful to commemorate and preserve memories like today. I have been to the Slave day remembrance before and I liked the fact that there are poetry and song, at tonights event we were also entertained with the powerful songs and poetry that moved you. The service ended with us lighting a candle in remembrance of the other areas of forced removals and a night walk up to the cairn placing a red stone in remembrance – this was a particularly moving experience as it is in the middle of the construction of CPUT residence. The emotion was pulpable in the speakers voices as this was suppose to be a public space of remembrance therefore overshadowing the whole procession it was actually a sad end for me as I felt it should have been a more open and inviting experience. I thank the organisers for events like this for us to learn and appreciate our rich history and as a young South African I encourage more youth to be involved and be open to learning in order for us move forward as a more vibrant accepting country – free from all the negativity from our country’s past. This entry was posted in Uncategorized on February 11, 2015 by shaunjengel.